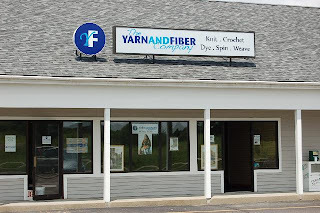 Yarn and Fiber Happenings: The Yarn and Fiber Company New Digs and A Very Warm Thank You! The Yarn and Fiber Company New Digs and A Very Warm Thank You! "We" moved. Well, it is almost done. 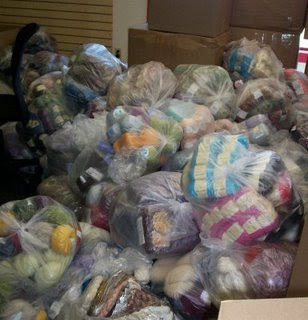 We have only a few boxes left to unpack and the last of the yarn has to be put away. Our wonderful new shop has everything we had dreamed of and more! 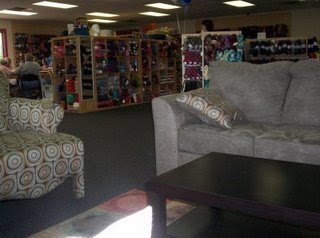 Our new location is fantastic and although it seemed huge at the beginning, as "we" unpacked the yarn, it seemed to expand and fill our new location... hmmm... how does that happen so quickly :) So, in addition to all the wonderful yarn and products, we have added a very special place - a Sit, Knit and Chat area. That is Tom (and I think Brian's knee) sitting in the SKC area - he and his sons, Brian and Chris, moved all of our heavy stuff like it weighed nothing! Amazing, simply amazing! To see the move in it entirety, I have to thank Lauren for such an awesome blog writeup... she documented from the start of the move to the end including the Friday Night Knitting Group the first Friday at the new shop - you just have to check out all those smiling faces! And Donna added us as a project in her Ravelry project folder.... I have borrowed a few pixs from both Lauren and Donna to show you the new shop... but the my favorite picture is the one of the "Few Skeins of Yarn" that Lauren posted... I may have to get a copy of this one framed for the shop! It is fantastic - many new and old friends come and spend a few hours working on or starting a new project while enjoying the comfort of the new sitting area. All is well in the land of The Yarn and Fiber Company and it just keeps getting better! Our new location is Clearbrook Center, 11 Manchester Road, Derry, NH 03038 - and only a few miles from our old shop in Windham. If you come at breakfast or lunch, I highly recommend the bagel/coffee/lunch shop located two doors down from us - they serve a full breakfast and lunch menu and have the tastiest bagels and a wonderful selection of coffees - come early as they close at 2:00. Now, even more importantly - the warm thank you! The reference to "we" used above actually is a symbol for the group of wonderful people who helped us moved. Let's put it simply - THEY ROCK! The entire shop was moved and 98% unpacked within a 2.5 day span. The packing began on Saturday at Noon and at Midnight on Monday, we declared it ready for opening on Tuesday morning - and yes, we did eat and sleep. All I can say is you are Absolutely Amazing and we can't possibly thank you enough! Thank you, thank you, thank you, thank you, .... !!!!! !